Launceston player-coach Ryan Westren says the club's current squad will find life in National Three South West "very tough" next season. 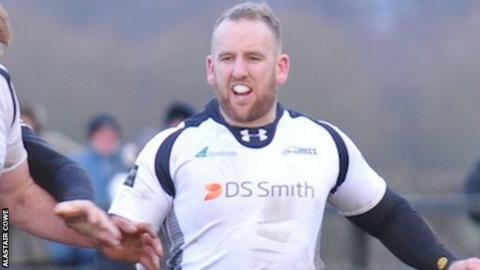 The Cornish All Blacks were relegated earlier this month and lost 79-0 at home to Bury St Edmunds on Saturday - the club's 24th loss in 25 games. "I'm under no illusions that it will still be very tough," Westren said. "And that's keeping the exact side that we've got now and you never know, that might not be the case." Talking to BBC Radio Cornwall, the former Cornish Pirates and London Welsh player continued: "A lot needs to be done and the club needs to sit down and plan for the future and put a system in place that's not just for next year." Launceston lost a host of their best players last season, with many moving to near-neighbours Plymouth Albion after they were relegated to National One. But despite losing all but one game - they drew with fellow strugglers Southend in Jimmy Tucker's first game as head coach in November - Westren says the club's young squad is still enthusiastic. "The numbers at training haven't dwindled, we're still having 30 or 35 players at training, so the want and the will is there - we just need to hone the skills and get the lads accustomed," he said. "There are some boys here who have never played men's rugby before, you can't ask them to go into National Two and do a job. "We struggled last year and we lost 10 players and I think if we'd have had those players this year we'd be pushing up the league a little bit. "It's a big ask for those guys to come in where normally they'd have years to bridge that gap."